“Let’s try not to do that again,” Shane says to the crew, still gathered on the bridge. “But no one actually made it inside the ship,” Dmitri points out. “That sounds like a good idea,” Alex agrees. “So, why don’t we, like… stop going to places where people are trying to kill us?” Alex asks. “Who the hell are you people that there’s always someone trying to kill you?” Alex asks. “Well… then maybe you should start sharing,” Alex replies. “H, you do realize that no one actually believes you right?” Shane asks him. “Uh… does anybody besides Inspector Gizmo here have an answer that actually makes sense?” Alex asks, giving H a strange look. “Okay, let me try to begin in a more understandable fashion,” Shane tells her. “Have you heard of the Red Suns?” Shane asks. “I can’t say that I have,” Minerva replies. “They’re a group of mercenaries,” Shane informs them. “Well, with a name like the Red Suns, that’s not surprising,” Minerva jokes. “We have a lot of evidence to suggest that they are, or at least were, attempting to create an army of Genesect,” Shane continues. “This,” Shane tells her, showing the two new members of the crew a chunk of the Genesect data on his Pokedex. “They’re making an army of murder machines?” Alex asks. “Never heard that one before,” Minerva tells him. “Trust me, as long as we’re on board you have no reason to fear any actual hand-to-hand combat,” Shane reassures her. The Helix drops out of warp space into Sector 19 in the Outer Rim, a boring stretch of space with a few systems containing uninhabited planets and Romanov military installations. The ship’s proximity sensors go off almost immediately upon exiting the gate; a sole ship is detected moving toward the Helix. Shane, Dmitri, and H head up to the bridge to investigate, and recognize the familiar signature of the UAS Corsair, the Alliance-make heavy frigate owned by the Red Suns. “Oh, those Red Suns?” Minerva asks. “We kind of had a run in with the Romanov Supremacy,” Shane tells him. “Well, that’s kind of how I explained it,” Shane tells him. “Wait… What’s this presentation going to be on?” H suddenly asks. “Yes. But I figured you were giving me useless information as you normally do because people give useless information,” H replies. “You know this guy?” Shane asks. “You survived somehow,” Dmitri points out. “Well, he is very much alive, mate,” Arlon tells him. “I-” Arlon starts but he finds himself at a loss for words. He just shakes his head in bewilderment. “He’s always like this isn’t he?” Minerva asks. “Cheers.” Arlon ends the calls and the crew of the Helix watch as the Corsair flies off into space. “Well if it’s been sitting there for ninety-two-million years, I’m sure it can sit there just a little bit longer,” Minerva agrees. She turns the ship back toward the gate and sets a course for the core Genevan sector. Realizing he has not seen Morgan for several hours, Shane becomes worried and looks around the ship for her. Not finding her around any of her usual spots, Shane checks her room. He knocks and hears no response. He does notice the door is unlocked, so he opens it and sees Morgan lying on her bed facing the wall, her back to the door. “Morgan are you okay?” Shane asks her. No response. She appears to be attempting to pretend that she is sleeping, but it is quite obvious to Shane that she is wide awake. “You don’t have to be afraid of… whatever it is that you’re afraid of,” Shane reassures her. Sensing Morgan needs some more alone time, Shane exits the room. As he makes his way back to his own room, Shane notices Alex stumbling around in the corridor, seemingly a bit tipsy from the sheer amount of time that the ship has been in warp space recently. “Huh?” Alex asks, seeming a bit delirious. “I’m not wobbly… You’re wobbly,” Alex responds. “Okay…” says Alex. “I’m gonna stop standing up now.” Her knees give out and she slumps into a sitting position on the floor. The Helix drops out of warp space in the Europa System, the heart of the Geneva Confederacy. Unlike the other nations, the Confederacy built the warp gate for their primary sector right in their capital system. The Europa system is quite the unique star system, boasting a plethora of habitable worlds. The passengers of the European life ship that left Earth had tried their best to preserve their cultural identities and, as such, this system had proved perfect for their needs. The member states of the Confederacy were each provided with a world of their own. The crew gathers on the bridge to figure out what to do next. “We still have three days until Armstrong’s talk, so we probably don’t need to go to Parisia just yet,” says Shane. “Already setting a course,” the pilot interrupts. After a brief flight across the system, the Helix arrives at Gaia, the gas giant home to a large portion of the population of the Europa System. The planet’s many habitable moons serve as the capital worlds for a large majority of the Genevan states. Minerva brings the ship down to München and docks in the moon’s major spaceport and economic hub. The crew then heads out into the city to browse the storefronts for supplies. “Have fun on your little shopping trip,” Minerva says over the comms as they disembark from the Helix. Wandering along the streets, the crew comes across a variety of stores. The buildings are lined with vehicle dealerships, hardware shops, personal equipment stores, and Pokeball boutiques. “But it wouldn’t be as classy!” Alex whines. “It’s really expensive. Do you even have that kind of money?” Morgan asks. “Right,” Alex sighs. A frown temporarily appears on her face. Her eyes soon light up again when she spots another store window. “Hey, look, Timer Balls!” She runs off once again. “Hey, slow down!” Morgan shouts after her. Morgan just sighs and follows the others as they continue shopping. The two keep walking along and eventually come across a shop specializing in warp drives. Entering the store, they see all kinds of warp drives for varying makes and models of ships. Feeling a bit overwhelmed, Shane decides to ask one of the employees. After spending several hours exploring the streets and geeking out over all the fancy Genevan tech, Alex decides to spend her money on TMs. She had been consistently getting knocked out of battles since she met Helix crew. All her Pokemon had been knocked out when they fought Gilgamesh, and Anubis nearly died in the battle against Heilovic. Alex’s Pokemon were with her through all the years she was alone; they are like family to her. She can’t stand the thought of losing a single one. She had come to the realization that she needs to start training harder and teaching her Pokemon better moves; their lives depend on it. “I have a gym badge!” Alex declares, showing off the Warp Badge she received from Gilgamesh. “Okay… Um… I’ll take that one, and that one,” Alex decides, selecting a few TMs that she thinks will be useful. Satisfied with her purchases, Alex makes her way back to the Helix, finding most of the others have already returned. They appear to be discussing what to do next. “I would like to Wonder Trade before we leave,” says Dmitri. “I as well,” H agrees. “Sounds like a good idea,” says Shane. 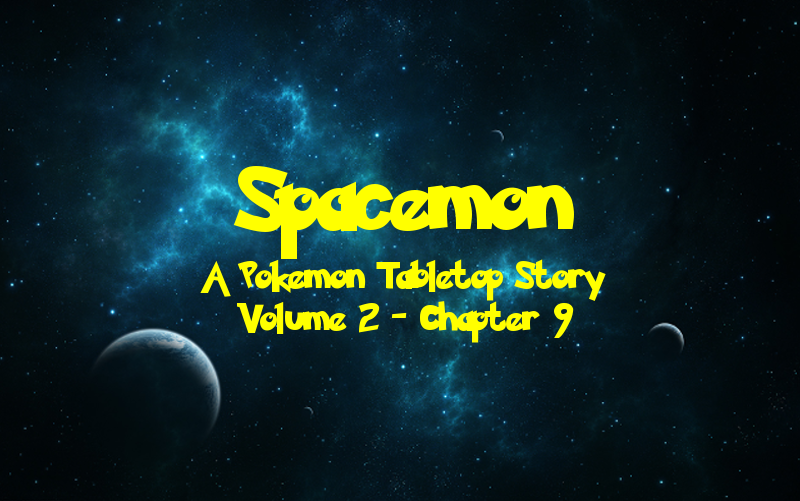 Alex follows the crew as they disembark once more, this time headed for München’s Wonder Trade center. “Where are we going?” the girl asks. “To the Wonder Trade center,” Dmitri tells her. “It’s where you trade away one of your Pokemon and get a random one in return,” Morgan explains. “Well, not everyone is as attached to the Pokemon they catch,” Morgan tells her. “So I can trade for something I do want,” says Dmitri. They arrive at the Wonder Trade center which has a few people milling about, making trades. Dmitri walks up to one of the machines and places the Pokeball containing the Qwilfish he received from Wonder Trading on Delphyne inside. It is warped away by the machine, and a new Pokeball appears in its place. Dmitri picks it up and releases it. A Noibat pops out and starts flapping around the room. “But what about the other Pokemon?” Alex asks. “I’m sure it’ll find a nice home,” Shane reassures her. Morgan goes next and trades in the Tynamo she caught on Messina and receives a Bellsprout, which she also decides to keep, figuring it will be a good support Pokemon for her team. H goes next and trades away his Chinchou, also from Messina, and ends up with a Buizel, which he promptly names #9. Shane goes last and trades the Tynamo he also caught on Messina and receives an Amaura. Satisfied with their Wonder Trade results, the crew returns to the Helix and prepares to leave the moon. Session Notes: Well this certainly was a long chapter for a session that started off with a whole lot of nothing. We barely went over our usual length and we got like almost nothing done and went on ton of tangents yet somehow the write-up proved to be one of the longest yet. Some really big things happened toward the end but we’ll get to that in the next couple of chapters. Arlon Jett makes his first Volume 2 appearance! And he’s… British? Yes, you may be wondering about that. The truth is that he’s always been British but I wasn’t really able to do the accent during RP. Now that he’s not my PC I’m going to start attempting the accent for his few appearances, and will definitely be writing it here (and when I go back to rewrite Volume 1 with the current writing quality I’ve been going with for Volume 2). Being from the Geneva Confederacy, which is essentially Space Europe, I felt it appropriate to give him an accent. He certainly has more of an attitude now and I love it. His purpose here was to present the party with a tough choice. Do we go to the Mirrored Temple, which is the thing both the players and their characters want to do first, or this time-sensitive thing which is super important. Ultimately we decided to go after Armstrong. Meanwhile on the UAS Socially Awkward… (No seriously, most of our characters don’t know how to fit in normal Human society), Shmorgan is totally going to happen! Too bad they’re both too awkward to realize it just yet, no matter how bad their players want it to happen. But this ship will take flight soon enough.